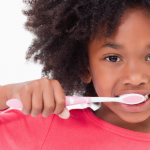 It’s highly common for parents to wonder when to get braces for their children. Typically, it’s advised that children receive an orthodontic evaluation by the age of 7. It’s around this time that irregularities in bites and misalignment of teeth become apparent and allow a determination if braces are warranted. If an assessment reveals that a child will benefit from braces, a treatment plan will be put into place. Braces, however, are not simply relegated to children. 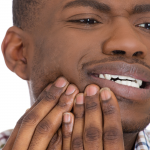 There may be a time when adults wonder if and when to get braces. Find out more about timing, terms and criteria involving an age-old teeth-straightening staple. It makes sense that a child would be evaluated for braces at a fairly young age, but is there actual specific criteria to indicate the need for braces? There is. 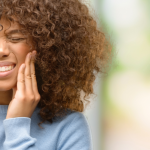 As baby teeth make their way out, orthodontists can begin to gain insight into how permanent teeth will come in (erupt) and how they may affect bite and alignment. Again, an in-office assessment will definitely determine if a child needs braces. Generally, it’s between the ages of 8 and 14 that a treatment plan for braces will be implemented. Thankfully there is no time limit of when to get braces. In fact, a study demonstrated that adult orthodontic patients rose 14% from 2010 to 2012 (18-plus years of age and older.) While preventative care is naturally desirable, and the reason a majority of children versus adults receive braces, adults can be treated with braces at any age. As with children, a consultation with an orthodontist will reveal the best time for when to get braces as an adult and what method will be most successful. An orthodontic recommendation for braces is not the ordeal it once was. Whereas in the past, metal braces were somewhat a subject of ridicule, not to mention causing levels of discomfort for the recipient, advancement in orthodontic techniques and technology have made the process more inviting and less of a social stigma. 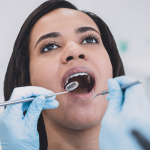 Braces have remained an effective treatment for correcting anything from overbites and underbites to overcrowding, awkward spacing and more when it comes to teeth positioning and jaw alignment. With an average time period of 24 to 36 months of treatment and a cost in the range of $3,000 to $6,000, metal braces are still the most effective go-to to adjust many common problems involving the teeth/jaw. There are also other alternatives to metal braces, including ceramic and clear brackets and Invisalign, a process of straightening teeth utilizing transparent aligners. The question of when to get braces these days comes with a much more open-ended answer: and is almost always – whenever you want! 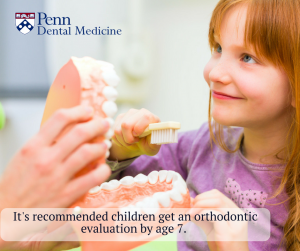 At Penn Dental Medicine our students are highly skilled in helping you find the perfect solution for your dental and orthodontic needs. Contact us today at 215-898-8965 to schedule an appointment.